☕️ ELIMINATE STRESS & SIMPLIFY Coffee Making! Enjoy Coffee In It's Purest Form With Less Stress & Less Steps. Simply Add Hot Water To The Grounds Of Your Choice And Press. Savor The Natural Flavors & Aromatic Oils of Your Favorite Coarsely Ground Coffee In Your Beautifully Designed Bamboo French Press. The Best Choice For Busy People Who Want To Enjoy Their Coffee Now! ☕️ IDEAL SIZE Perfect For You! Brew 2 Cups Quickly! No More Enduring The Poor Coffee Supplied At Work, Or Waiting For For A Weak Pot To Brew. A Clever, Versatile Purchase. Perfect For Your Home, Office, Students On Campus, For Your Camping Trips, Your Cottage, Or For Proudly Setting Out To Enjoy With a Friend. No Electricity Needed. ☕️ SAVE YOUR MONEY Enjoy Your Coffee As Often As You Want, With The Beans You Want, Without The Cost Of Expensive Coffee Shops Like Starbucks And Pricey Nespresso & Keureg Pods. Freshly Brewed Cups Of Coffee Whenever You Desire. Includes A BONUS 1 TBSP Coffee Grounds Scoop. Flavorful Coffee In It's Purest Form Without The Premium Price. ☕️ GIFT GIVING MADE SIMPLE A Gift That Is Perfectly On Trend & Will Be Appreciated By Him Or Her. An Eye-Catching Gift For Birthdays, Christmas & Housewarmings. A Thoughtful Gift For Students Who Will Love The Bamboo Finish. Absolutely A Favorite Gift To Be Received! 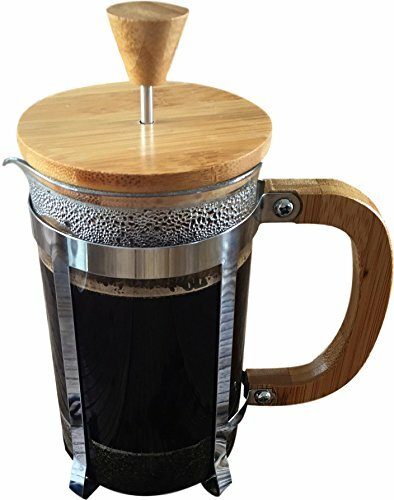 Your Bamboo French Coffee Press Comes In A Gift-Box For Ease Of Giving. Show Your Great Taste In Gift Giving! ☕️ WE VALUE OUR CUSTOMERS And Always Strive To Provide Quality, Functional & Delightful Products To Inspire Your Life At Home. Starizzo Is A Brand You Can Trust. At CopperCrate We Guarantee Our Products And Our Top Customer Service To You, Our Valued Customer, Or Your Money Back. If you have any questions about this product by Starizzo, contact us by completing and submitting the form below. If you are looking for a specif part number, please include it with your message.